Fenestrated endovascular aneurysm repair (fEVAR) has been introduced into the clinical practice to treat patients with abdominal aortic aneurysms (AAAs) with inadequate infrarenal neck, where visceral vessels need to be included in the endovascular reconstruction. 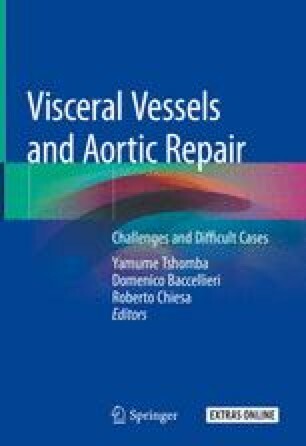 The first fenestrated repair has been described by Park in 1996 using a device modification to incorporate an accessory renal artery, in a patient with infrarenal aortic aneurysm . Since these pioneeristic experiences, the technique has dramatically evolved over time. The main body of the endograft was improved after bifurcated endografts for the endovascular treatment of AAAs were proposed in the late 1990s by Stelter and afterward widely adopted. The success of these experiences led to the development of a tubular upper module associated to a separate distal bifurcated component, similar to the contemporary unibody, to treat inadequate aortic necks. Gold radiopaque markers were added to highlight fenestration margins under fluoroscopy and facilitate identification and alignment of the fenestrations with their respective target vessels. The openings in the graft material were reinforced with nitinol rings around the fenestrations to create a more stable and durable connection with the stent. To facilitate endograft alignment, diameter-reducing ties were added to partially constrain the graft following unsheathing, to avoid adhesion of the graft to the aortic wall and allow rotation of the device along the vertical axis and movement to a more proximal/distal level.